Sneak Peek at the new FBorFW Treasury Book! We’re thrilled to announce that Lynn’s first FBorFW treasury book will be released this fall. You’ll be able to pre-order it from our store shortly! 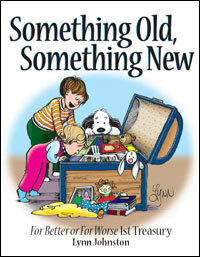 Inside Something Old, Something New, award-winning For Better or For Worse cartoonist Lynn Johnston takes readers to a place where Dad makes mental notes because he can’t read his own handwriting, Mom can’t get sick because she doesn’t have the time, and too much quiet from the kids can only mean disaster is about to strike. Something Old, Something New features storylines from the strip’s first three cartoon collections–I’ve Got the One-More-Washload Blues . . . , Is This “One of Those Days,” Daddy?, and “It Must Be Nice to Be Little”–with entirely new cartoons and full-color Sundays. Something Old, Something New follows John and Elly back to where it all began as Michael prepares for his first day of kindergarten, Elly returns to school trying to get her English degree, the family adopts Farley, Elizabeth grows from baby to toddler, and despite her best efforts, Elly can do nothing to treat John’s hopelessly incurable fashion sense. It takes a keen eye to recognize life’s shared experiences and an even keener intellect to assemble those moments in a humorous and heartfelt way. With For Better or For Worse, Johnston elevates everyday aspects of life into brilliant observations on personal career goals, parenting choices, and coffee klatch friendships. This entry was posted in News and tagged something old something new treasury fborfw lynn johnston on August 11, 2010 by fborfwnews.